The original route is a five and a half mile circular footpath that takes in the surrounding countryside in the north of the Town. You can download a copy of the route from this link. The Northern, Southern and combined routes are shown on the Great Aycliffe Way leaflet here. Initially the route travels through Woodham Burn before turning north through Woodham Park, Agnew Plantation and Rope Moor Wood. The trail then takes the walker through woodland adjacent to the Middridge Road before veering through Byerley Park and down behind Greenfield School. From here the walk brings you past Burnhill Way and once again joins the Woodham Burn. A secondary loop has recently been added which covers the southern part of Newton Aycliffe. Again the route takes in Woodham Burn before heading off to the right at the top of the burn near Woodham Community Technology College. The route navigates around St Oswald’s Park before heading south adjacent to the A167. The path then travels west along the Simpasture Railway line before crossing the road towards the train station. After the train station, the route is followed until the walker is returned to the starting point. While the walks are designed to navigate the fringe of Newton Aycliffe the route maintains a gentle countryside stroll feeling as most of the route is lined with trees and woodland, this results in the walker often not realising how close they are in proximity to the housing. The route rarely comes into contact with traffic as roads are avoided and underpasses are used as often as possible. 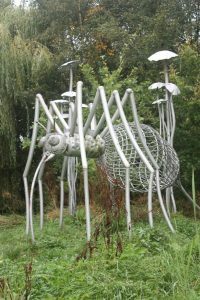 An added bonus of these walks is the art sculptures which are scattered throughout both the routes. Sculptures in stone, metal and wood are located at various surprising locations throughout the walk. They depict various aspects of the Town’s history, folklore and nature. The routes are patrolled in their entirety on an occasional basis; however, the areas where regular problems are known to occur are patrolled on a more frequent basis. During these inspections area of litter, fly tipping and places where vegetation are becoming overgrown are identified along with any potential hazards. The entire route is either tarmac or a wheelchair friendly surface, however, due to its extensive nature there are a few inclines where assistance may be required in a wheelchair (The main location where this may be necessary is a the head of Woodham Burn). Both routes are ‘way marked’ with either strategically placed posts or directional signage. Seating is available throughout the route; however there are locations where there may be a long walk between seating. Great Aycliffe Town Council is unable to survey the site as often as they would like, if you see something that you feel the managers of the site should be aware of, then please contact the Works and Environment Manager on (01325) 300700.